Adorn your feet with majestic socks! Whether you’re a queen or merely a serf, everyone deserves to wear something resplendent. The cuffs are crowned with lace, and imperial cabled columns spiral down each leg before converging at the heel and instep. A smooth stockinette foot and modified wedge toe add a regal simplicity to balance out the detailed legs. 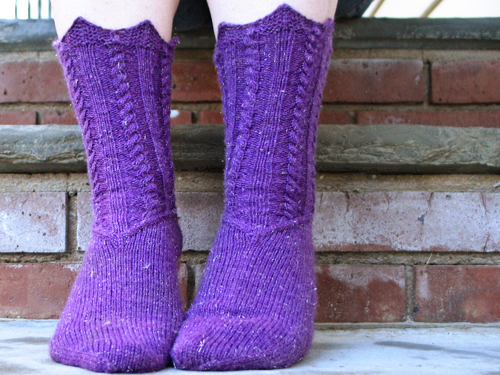 The nitpicky among us will note that a true tyrian purple is warmer, more of a plum or magenta shade than the plush purple sample socks. Still, the spectacular sparkle in this yarn should be more than enough to make anyone feel like royalty. Skills needed: Cast on, work in the round, knit, purl, cables, decrease, increase, short rows, grafting.